This drum deserves its own page. 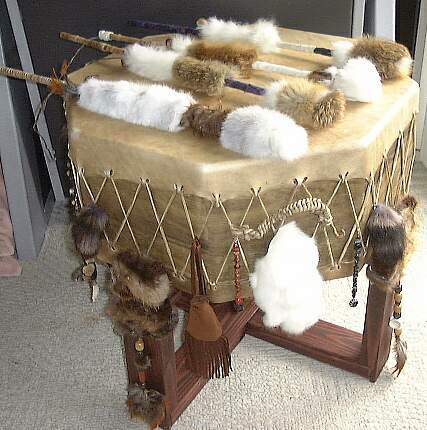 It is a Native American Ceremonial Drum...also known as a Pow Wow Drum or Gathering Drum. It is meant to be played by a group of drummers simultaneously. This beautiful drum was built for me in Oregon by my friend, Clifford Latta, AKA 'Grey Wolf'. 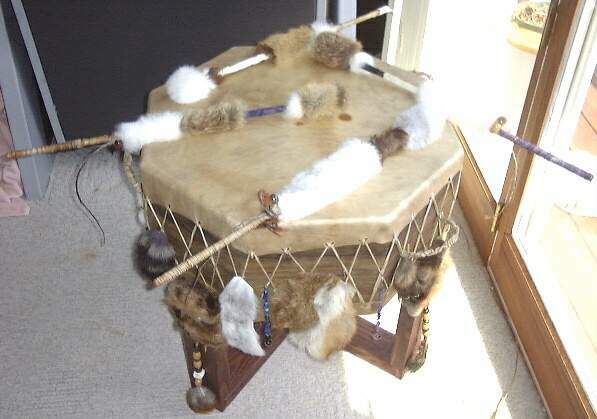 The drum is made from red mahogany and the drum heads are elkhide. The decorating of the drum, stand and beaters was done by me. This has been a labor of love. One of the beauties of Native American culture is the attachment of human qualities to elements of nature. Of course, there are differences from tribe to tribe but I believe that the first definitions I found were the ones I was meant to find. For example, some tribal cultures consider elkhide to denote such qualities as strength, fitness, confidence, joy, wisdom, responsibility, working through fear and trust, and a leap of faith. The string of beads you see on the left of the picture above consists of chips of Snowflake Obsidian and blue ceramic and glass beads. The stone Obsidian is believed to "purge negativity and stabilize erratic energies." The color blue represents Intuition. 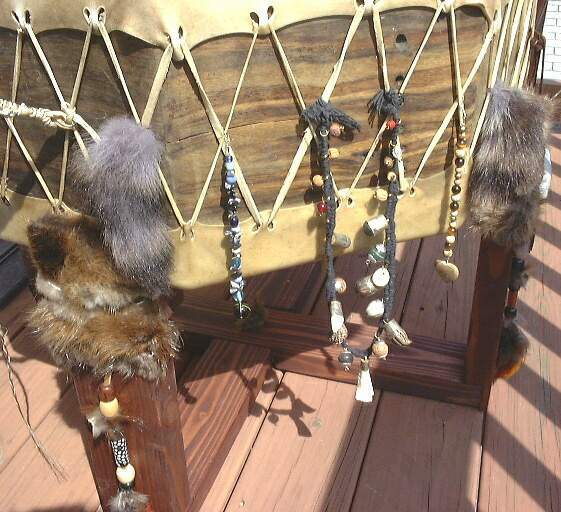 The strand hanging from the drum to the right consists of Picture Jasper and Tiger Eye. A heart of Picture Jasper is suspended from the bottom of the strand. Jasper is considered to possess healing properties while Tiger Eye symbolizes clarity of perception. Hanging between the two strands of beadwork is a Medicine Necklace. It holds bone, seeds and other materials and objects considered to have healing properties. Also seen at the corners of the drum in this picture are the small gray and white striped racoon tail ends. 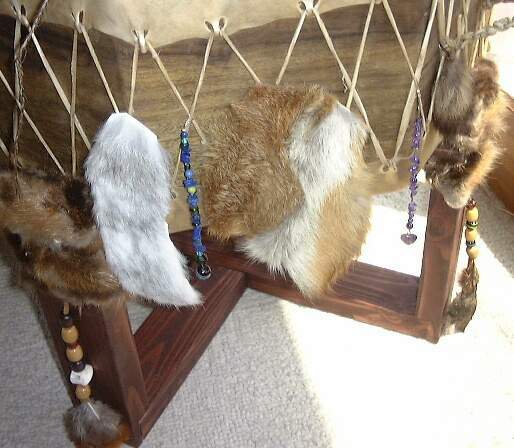 The racoon is used to symbolize openness, cleansing, merriment and humor. 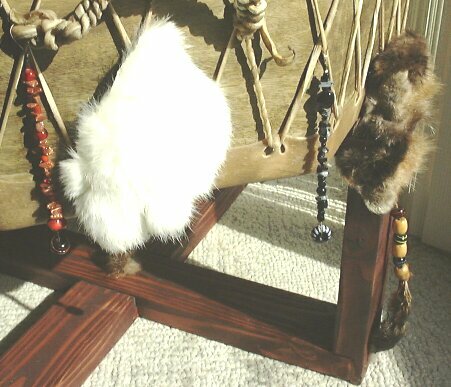 The string of beads on the left of this picture consists of chips of Goldstone and red ceramic and glass beads. The color red represents Faith. The strand to the right consists of Snowflake Obsidian and Onyx. Black is considered by some to symbolize harmony and listening. There is a tuft of white rabbit fur hanging from this drum. The rabbit represents growth, dealing with fear, listening, and self-actualization. The string of beads on the left are a combination of chips of royal blue Lapis and blue and green ceramic and glass beads. The color green represents the Will. The jewelry strand to the right consists only of Amethyst. Amethyst is considered the "Healer, purifier, and amplifier of energy." It is said to "transform blocked energies". From the bottom of the strand hangs a heart of pure Amethyst. The tuft of fur hanging between these strands is fox. The fox, as you might guess, represents cunning and intelligence. The string of beads on the left of this picture is made up of chips of Picture Jasper with brown and yellow glass beads. The strand to the right consists of pure crystal representing clarity and focus. Among the crystal is a single white freshwater Pearl. At the end of the string hangs a heart of white Howalite. Between the 2 strands of gemstones is the head of a Golden Pheasant from China. I got it from Grey Wolf because he "liked the colors". 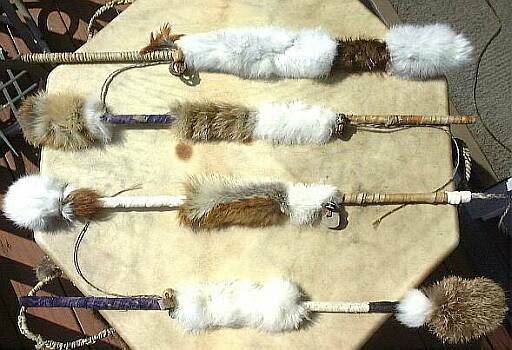 His opinion on the use of non-traditional feathers on a Ceremonial Drum is, "Drumming is universal, anyway." Hanging in front of the stand leg in this picture is a braid of gray and white horsehair. (I learned to braid hair just so I could do that!) Many tribes consider the horse to represent stabilty, courage and perseverance. The coyote is often used to describe duality and the ability to see both sides of any issue. The coyote is referred to as the Trickster because of his ability to trick us into revelation for our own benefit. I considered the significance of all of the elements that went into building and decorating this drum. I considered what I do for a living (some would say I approach my work much like a coyote ;). I considered the caring spirit of Grey Wolf, who I know to be the kind of man that any of us would be lucky to have in his corner. And finally, I considered the drum and it's power to set us free to journey while grounding us to the earth...its power to help us find our find our own voice while connecting us in common purpose...its power to teach us to leave the world of our thoughts and feelings in order to be present in this world long enough to enjoy a simple moment. 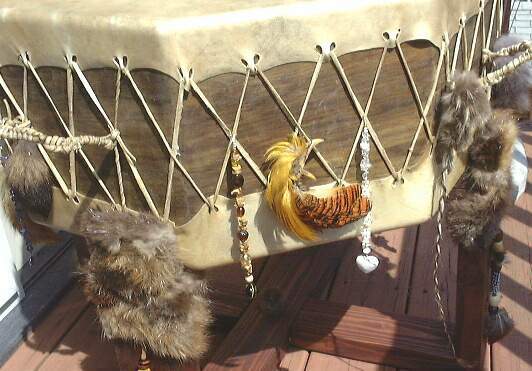 I considered all of this and named this drum, "The Healing Heart"
If I could write a piece of Native American music as beautifully as Elan Michaels, I'd have written original music for this page. Instead, you're listening to the song, "Buffalo Dance" by Elan Michaels.